The amount of care your canna lilies require will depend on where you live in the country. Cannas are tropical plants and can be left in the ground year round in zones 9 and 10. Unable to tolerate frosts and freezes, they will require more care when grown in zones 7 and lower. Canna lilies are colorful additions to any garden and with proper care you should enjoy their multiplying blooms for years to come. Choose a location in your garden that receives full sunlight. Canna lilies will not grow well in shady areas. Amend the planting soil with peat or compost if the soil is lacking nutrients. Cannas grow best in fertile soil that is not prone to sogginess. Clear the weeds and grass from around the canna lilies. Maintain a weed-free growing area at all times. Water the cannas regularly to keep the area moist. Depending on local weather conditions, two to three times per week should be sufficient. Canna lilies grow best in moist soil. Fertilize the cannas once a month through the growing season with a bloom-boosting fertilizer blend. Select either a granular or water-soluble fertilizer with a high middle number. 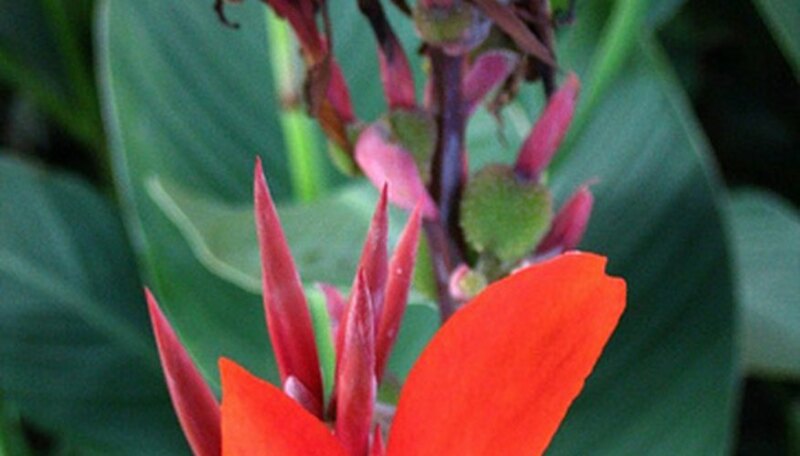 Cut the canna foliage down to 2 inches in height in the fall if you live in zones 7 or lower. Dig up the tubers in the fall if you are zones 7 or lower. If left in the ground, they will freeze, develop root rot and die. Store the tubers in peat moss and place them in a cool, dark area such as a garage. Make sure the tubers are well ventilated. Remove them in springtime and plant in the ground. If your canna lilies suffer through a freeze, immediately dig them up, cut off the foliage and store them. Canna lilies are generally pest free. If you notice a problem, use a product designed specifically for canna lilies. Canna lilies growing in dry conditions will be much smaller than those with an ample water supply.